Perhaps because I grew up living on an island in New Jersey just yards from the beach, I bonded strongly with the elements, Ocean, Sun, Wind, and Sand. I was aware from as far back as I can remember that God, Spirit, infuses it all. Drawing was my main vehicle of connection to these nature-spirit energies. During undergraduate work for my BFA in painting/printmaking from Carnegie-Mellon University I discovered the creative psycho-spirituality of C.G. Jung and engaged in Jungian analysis. Dreamwork, dancing, drawing, and drumming have continued to be ways to tap into the body and the collective unconscious, the Inner Wild. Communing with nature and drawing the Outer Wild, I am guided by the processes and synchronicities that arise at the intersection of Inner and Outer Wildness. I have been a member of a biweekly Dream group and a monthly Authentic Movement group for over twenty years. While at Carnegie I learned the craft of bookbinding. In San Francisco I became a designer bookbinder and taught artists creative book structure in the MA program in Book Arts at Mills College, Oakland for many years. I also studied Transpersonal Counseling at the California Institute of Integral Studies. When we moved to North Carolina I earned an MA in Counseling and again engaged in Jungian analysis. I worked as a spiritually oriented psychotherapist, with individuals and with women’s groups, for some twenty years. I have recently retired. Living here in North Carolina, I was privileged to meet Thomas Berry, a leading voice for the sacredness of nature, and hear him speak many times. I was a tour guide for some ten years at the North Carolina Botanical Garden, a native plant conservation garden, then received Certificates in both Botanical Illustration and in Native Plant Studies. I have visited and made drawings of many NC Natural Communities, the precious, beautiful habitats of our coastal plain, piedmont and mountain bioregions. I’m always trying to hold together matter and spirit, a naturalist’s view of native plants and animals, with a mystic’s view of the sacredness of our landscapes. I am a certified Leader of Dances of Universal Peace and a leader in Ziraat, the earth-spirituality focus of Sufi Ruhaniat International. Ziraat practice holds nature, self, and spirit together. For the past six years my service to the community has included leading public multimedia Seasonal Celebrations and ceremonies, honoring the soul of the seasons on the wheel of the year. My husband and I have restored the bottomland forest of our semi-rural acre largely with plants rescued from development. We have an inventory of over 250 species of native plants and 100 species of fauna in our Garden Sanctuaries. The Forest Garden has been certified as a National Wildlife Federation Wildlife Habitat, a NC Native Plant Conservation Garden, and an Audubon Bird Friendly Habitat. We have created a Moss Garden Sanctuary, a Medicine Wheel/Herb Garden, a Native Wildflowers Forest Path, a Pollinator Garden, and a Pond with Waterfall that frogs found immediately and love. Currently I am focusing on writing Pilgrimage Stories about our trips to sacred landscapes here and abroad. 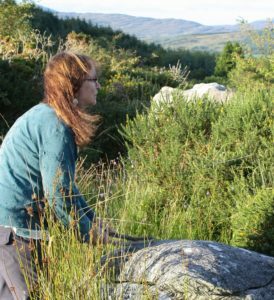 For the past eight years my husband and I, both of Irish ancestry, have pilgrimaged to the stone circles, holy wells, and sacred landscapes of Ireland and the British Isles, where we make ceremonies of connection to our ancestors and to the spirits of the land. Mara Freeman has been a teacher and mentor in this work. Daniel Foor has been my teacher in ancestral healing work. 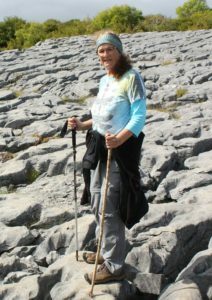 I am also grateful to our Irish friends and guides. Mostly we learn from the Land herself as the Body of the Mother.